First off, you can’t call football “football” here in Switzerland, as soccer claims that name all over the continent. We have to call it Football Americain, which always starts a very amusing debate about why it’s called “football,” since we don’t kick it all that much. Having grown up in Toledo, Ohio, and lived in Lancaster, Pa., for more than 20 years, I have been playing “real” football all my life—pickup, school intramurals and rough touch and flag leagues. When I moved to Switzerland for work (I am a journalist specializing in watches for a number of magazines and newspapers), I desperately wanted to keep playing. One of the first people I really connected with in the watch industry in Switzerland was Guillaume Tetu, who had worked for TAG Heuer and was setting up his own company, Hautlence, manufacturing high end watches ($30,000 and above). Tetu was already playing for the Neuchatel Knights, a full-on helmets-and-shoulder-pads team that was part of the National Swiss Football League. When Guy found out I was a quarterback, he immediately invited me to play for the Knights’ tackle team. You see, quarterback play is definitely one of the weaknesses of teams here. Europeans just don’t grow up throwing, so there is a dearth of quality passers. There are plenty of young, fast guys who can run and catch, and big, strong guys who can block and tackle, but moving the ball through the air is a challenge. So in most of the tackle leagues, the ground game takes precendence. Even my wife, Sophie, who’s a Brit, throws a better spiral than most of the men here—because I forced her to play catch with me! I said no to playing quarterback for the Knights—58 years old this year, the last thing I needed was to be clobbered from the blind side. 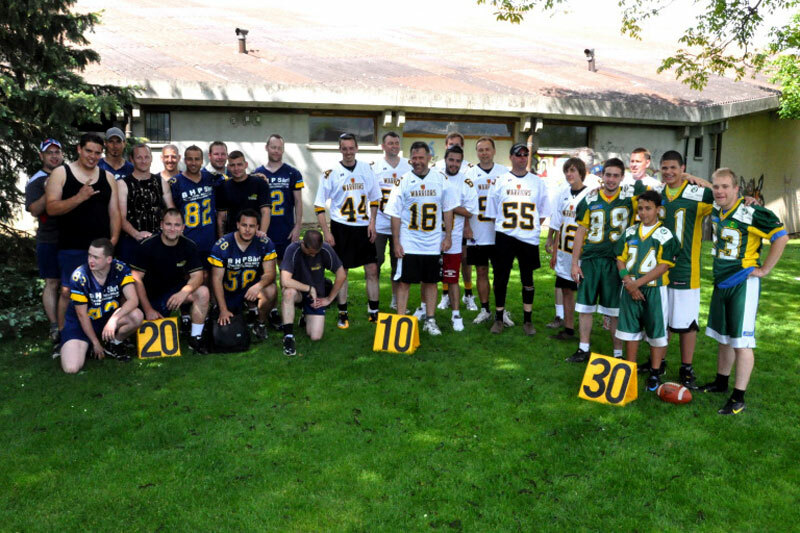 Instead I formed a team, the Geneva Warriors, to play in the NSFL’s flag football league. The Warriors are composed of two Americans, Tetu (who is French), four Swiss, one Irishman, one Brit and one Canadian. The MMQB goes overseas to discover where, how and why American football is being played abroad. 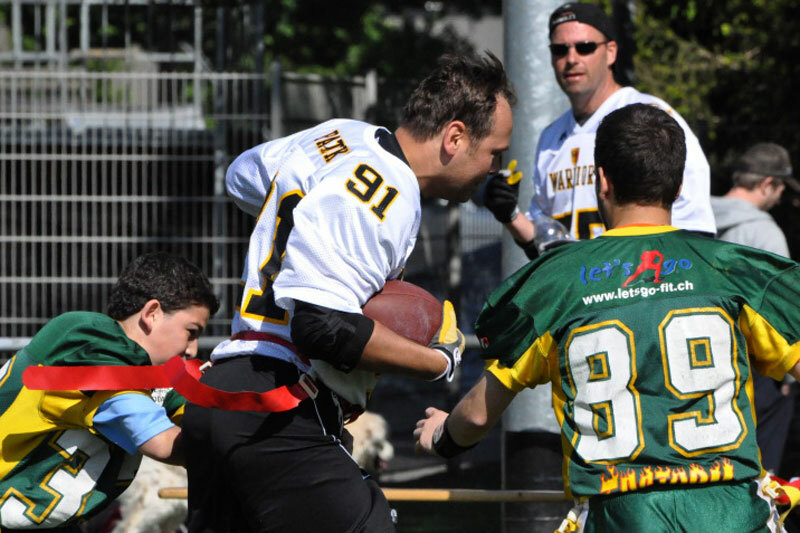 The Warriors have played five seasons in the NSFL, and have competed in several flag tournaments in Switzerland and France. The biggest of these tourneys is the Flagad’Alpes in Thonon-les-Bains, France. Thonon and its team, the Black Panthers, have been hosting the tournament for 20 years, and they expect to have 30 teams this year, with a total of about 300 players from all over Europe. 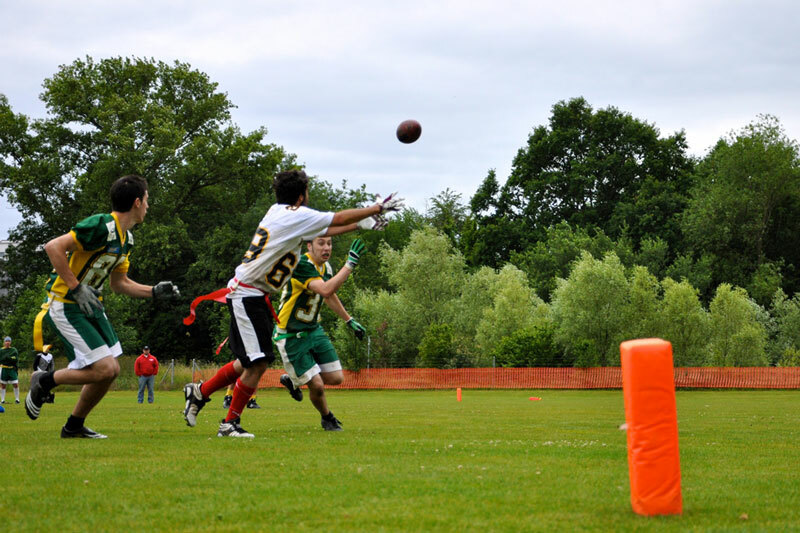 Playing American football here in Switzerland and France has been just the thing to keep alive my connection to the sport that I love. Football is growing over here, and whenever I have the chance to introduce someone to the game, it takes hold immediately. Recently, one of the fathers of a boy in my six-year-old son’s class asked about playing. John Claughton played rugby as a kid growing up in the U.K. and watched NFL games every Sunday with his father but had never played himself. I invited him to join us for a Warriors practice. He was so excited to finally play, and not only was he pretty good, but his passion for the game and his pure enjoyment were fun to watch. Claughton is now a full-fledged member of the Warriors, prepping for the Flagad’Alpes tournament in September. Wish us luck! Keith Strandberg is a journalist, filmmaker and educator. His website is www.keithstrandberg.com.